The Gaston County Jail opened on November 1, 1999. The Jail has over 160,000 square feet and has a total bed capacity of 408 with an operating inmate capacity of 368. The facility houses male state pretrial detainees and convicted inmates sentenced to serve their time under the supervision of the Sheriff. The Jail is also contracted with the United States Marshal’s Office to house pretrial federal inmates at a per diem rate of $73.00 per day. There is an on-site Medical Unit which has medical staff available 24 hours a day to provide medical care to the inmates at the jail and jail annex. 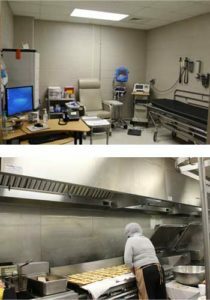 The jail kitchen is operated by a contract food service provider, which provides three (3) meals a day to all inmates housed in the jail and the jail annex. The menus are prepared in consultation with a registered dietitian including any special or modified diets meeting the state requirements of 2100-2500 calories per day. State Work Release inmates pay a daily rate based on their yearly income with the minimum being $18.00 per day and the maximum being $36.00 per day until their sentence is completed. The Jail Annex is also responsible for inmates sentenced to serve weekends in jail, by processing the inmates in and out of the facility each weekend and ensuring their sentence requirements are fulfilled. 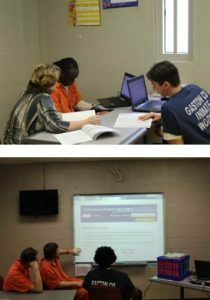 The Detention Facility offers numerous programs for the inmate’s benefit. These programs are partnerships through various agencies. The Gaston County Jail Annex was initially constructed to provide additional housing for inmates and opened on May 3, 1996. The Annex has 24,740 square feet and a total bed capacity of 176 with an operating inmate capacity of 159. The Annex facility is used to house male and female pretrial inmates, convicted inmates and weekenders sentenced to serve their time under the supervision of the Sheriff. The Jail Annex also houses sentenced inmates with court ordered work release. The Jail Annex has a contract with the Federal Bureau of Prisons to house sentenced federal inmates on Federal Work Release program also at a per diem rate of $80.00 per day. 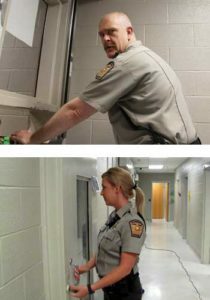 The Jail Annex staff is responsible for verifying and approving the employment status of each inmate prior to starting the program for the daily monitoring and surveillance of each inmate on the program keeping track of their employment status, hours they are out of the facility and recording their job site locations. Inmates on the Federal Work Release program pay a subsistence payment, which is 25% of their gross wages for each pay check they draw, off-setting what the Federal Bureau of Prisons pays monthly.